You can replace the images used by the login and logout screens with elements that reflect the brand of your organization by following the steps outlined below. This article covers PRPC 6.2 SP2. To replace the login screen in earlier versions, refer to the links in the Related content section. You can customize some or all of the graphic elements for the login and logout screens. However, to make any changes, you need to create and deploy a custom ruleset. Place in that ruleset the rules that hold and display your custom images. PRPC presents the login page to guest requestors — users who have started the PRServlet servlet but have not yet been authenticated by logging in. By default, the system uses the PRPC:Unauthenticated access group for guest requestors. To customize the pages, you need to create an alternate access group and a ruleset for your custom rules for the login and logout screens, and to instruct the system to use them instead of the defaults for guest requestors. 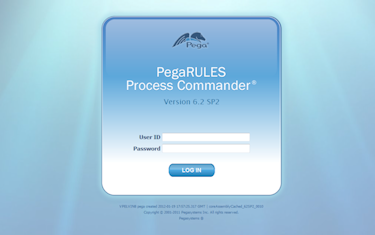 Create a ruleset and version to hold the rules for the login and logout screens. 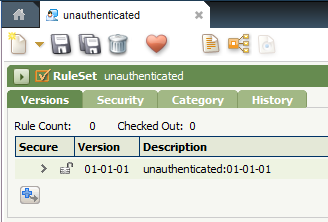 Give the ruleset a name that makes it easily identifiable, such as unauthenticated:01-01-01. Log out and back in to make the new ruleset is available in pick lists. Create a new access group for unauthenticated users. Specify the application and version as "PegaRULES" and set the current ruleset version. Add unauthenticated:01-01 in the Production RuleSets field to the new access group and to your own current access group (so you can save rules into it). When you save the access group, a warning appears that the ruleset you created is not defined in the application. You can disregard the warning for this ruleset. A binary file rule holding the background image for the login page. It holds a jpg image of 1738 x 1104 pixels. Save the rule with a distinct name, such as pxloginbackgroundCustom. A binary file rule holding the image for the login button. It holds a png image of 125 x 36 pixels. Save the rule with a distinctive name, such as pxloginbuttonCustom. pxlogindivbackground A binary file rule holding the image for the area around the operator ID and password fields, often displaying a corporate logo and text. It holds a png image, 524 x 524 pixels. Save the rule with a distinctive name, like pxlogindivbackgroundCustom. When CAPTCHA login security is enabled, the system uses this binary file rule to provide the background for the login fields and the CAPTCHA challenge. It holds a png image of 524 x 700 pixels. Save the rule with a distinctive name, such as pxlogindivbackgroundwithcaptchaCustom. Note If you customize some login images but not this one, you may prevent CAPTCHA features from displaying when they are enabled. For information about CAPTCHA, see How to Configure Login Security and Password Policies. This HTML rule defines the login page, specifying , (among other things) the images to use. Copy this rule into your ruleset without changing the name. This HTML rule defines the logged-out page, specifying (among other things) the background image to use. 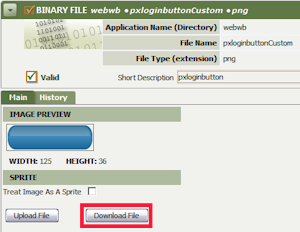 To use a different background image for the logout screen, create and reference a new binary rule file, and reference that image in Web-Session-Return (see below). Requestor Type data instances define the types of requestors that can access PRPC, such as a browser session, an external application, or an internal background process. The BROWSER Requestor Type establishes what is available to someone trying to access PRPC in the normal way, through the browser. In the Rules Explorer, select SysAdmin > Requestor Type. 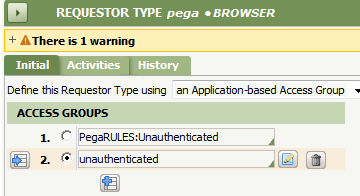 Select the Requestor Type "BROWSER" for System Name "pega". Save the Requestor Type. Make sure the radio button remained selected beside the "unauthenticated" access group. If it did not, select it again and save the rule again. You have prepared the ruleset and have updated the Requestor Type; however, you cannot see any changes yet because you have not updated any images or text. You are now ready to add your custom images to the binary rules. Open the binary rule form that holds the image you want to modify. Click Download File to download the image to your computer. In Designer Studio, click > User Interface > Image Gallery. Browse for the image that you want and right-click it. Select Save Picture As... to save the image to your local computer. You can start from the existing images or create images from scratch. Make sure you save the image with the same extension that the original image has (usually .jpg or .png). Open the binary file you want to update. Click Upload File. A form appears where you specify the image file you want to use. Once you have located the file, click Upload File to upload it and close the upload form. In the binary rule form, the original image has disappeared. Save the rule to display the image you uploaded.